The “how do you eat an elephant?” question is surprisingly accurate when it comes to Smart Cities initiatives. The answer, of course, is “one bite at a time.” At the CompTIA ChannelCon 2018 event in Washington D.C. in early August, we discussed what these bites will require, from the skills necessary to plan to the talent for implementation. It was my third meeting as the Vice Chair of the Smart Cities Advisory Council, and it rounded off nine months of discussions on various aspects of Smart Cities (or Smart Communities). This year, I was reminded that no single entity can successfully be an expert in all the skills and technologies required for Smart Cities. An ecosystem of partners must work together to tackle the unique challenges. Digital transformation in communities is nearly complete and very mature across the industry. Because of this maturity, we have cities and municipalities with a good grasp of technology that have successfully migrated to a digital-first mentality over the last two decades. 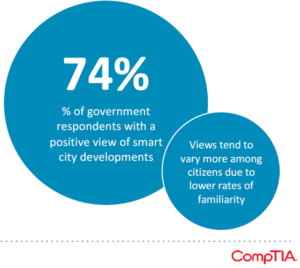 CompTIA research suggests that three-quarters of governments have a positive view of smart city developments, but citizens’ views vary because they lack familiarity with the issue. Vendors and solution providers should pay close attention to these lists. These are real concerns and potential causes of failure in any planned projects. They also reveal opportunities. For instance, one important concern is insufficient ROI. If vendors provide proof of ROI before the launch of an initiative, they can eliminate the funding / budget concern up front. There are also various ways to fund Smart Cities initiatives outside of citizen taxes. The industry and government should work closely to review options for grant funding, public/private partnerships, and success-based funding options to better meet the expectations of citizens while advancing the implementation of innovative technologies. Smart Cities incorporates and can leverage many of these emerging tech categories, including IoT, Automation, AI, 5G, Drones and Biometrics. With any use of emerging technologies, the goal is repeatability and the ability to successfully implement and operate a deployed solution. A Smart Cities deployment is not just a technology – it is a use case and overarching solution set. This brings us back to the title of this post. No single entity can master every required skill. We as the vendor community need to work together, each bringing our expertise to create a consistent experience and ensure a better outcome for the end customer. When we do, we can bring a brighter future and help build successful use cases for Smart Cities. There is a lot of technology and more than enough money to share across this new and exciting landscape. It is more important to hit the desired outcomes together than to fail alone. 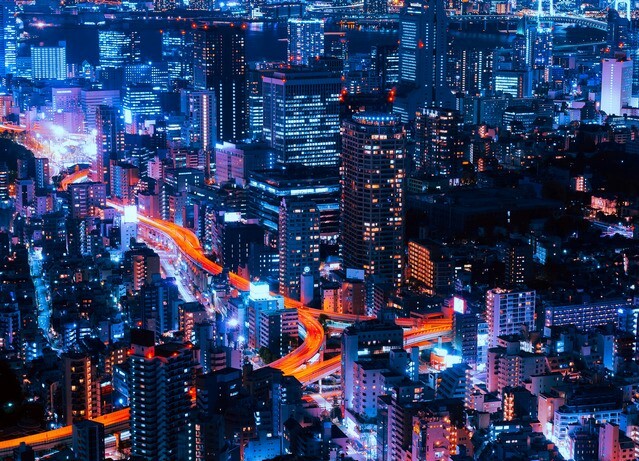 For more information on smart cities, connect with Aware360’s CTO, Robert Forget on LinkedIn. Or for general inquiries contact us. Robert this is an excellent recap of the current situation with Smart Cities/Communities and as you point out, we must all work together, public and private sector, industry trade associations, think tanks and the like. No one organization can make it all work. This is an extremely complex subject and the key is collaboration amongst all these groups, and it’s CompTIA’s mission to help drive awareness, education, research, and advocacy through our Communities and Councils to bring mainstream adoption of these technologies.